OAKLAND, Calif. – April 24, 2018 – Roofstock, the leading online marketplace for buying and selling leased single-family rental (SFR) homes, today released new data showing that average annual returns in the $3 trillion SFR market are comparable to stock market returns and outperform bond returns, but with considerably less volatility. For this study, Roofstock compared SFR housing returns data from the U.S. Census Bureau, as well as S&P 500 returns data and 10-Year Treasury returns data from 1992 to 2017. At its high point during this 25-year span, S&P 500 stocks posted average annual returns in excess of 35 percent, but returns also plummeted equally during their worst year. Alternatively, SFR investments posted 17.5 percent returns during their best year, and only declined 2.5 percent in their worst year. The stock market had a total of six down years in this period, while the SFR sector only had two down years. 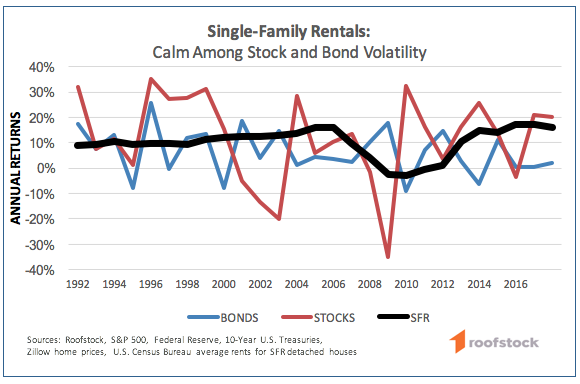 Bond market returns were also more volatile than SFR returns, but less risky than stock market returns on an annual basis. 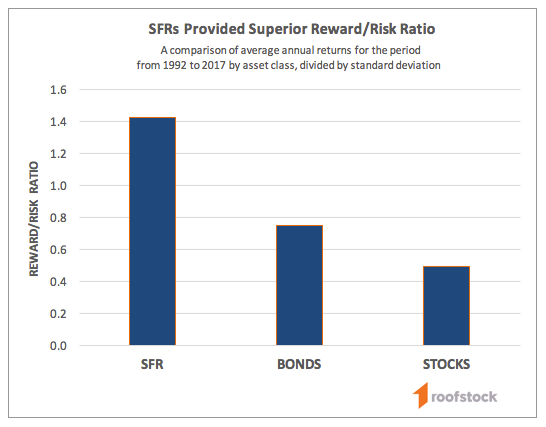 Investors who add real estate to their investment portfolios further reduce their exposure to risk since SFR returns are highly uncorrelated to the stock market, according to Roofstock’s new data. In fact, SFR prices and stock prices have proven to be almost perfectly uncorrelated since 1971, with a correlation coefficient of only 0.07. “To put that figure into perspective, a coefficient of zero equates to a complete lack of correlation,” notes Beasley. For more information on SFR returns vs. stock and bond market returns, visit Roofstock’s blog. Roofstock is the leading marketplace for investing in leased single-family rental homes, with 25 markets across the U.S. The Oakland, Calif.-based company provides a comprehensive solution for all types of investors to buy, own and sell rental homes. By eliminating the geographic barriers to being a property owner, Roofstock is democratizing real estate investing.